Recently the repair works on NELHA’s 40-inch deep-seawater pipe were successfully completed. 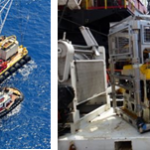 Operating at 150M depth and using remotely operated vehicles, it was quite an undertaking. The high-density 1.2-mile-long polyethylene pipe, installed in 1987, extends to depths of 2,000 feet. The pipeline is the backbone of the Natural Energy Laboratory of Hawaii Authority’s coldwater aquaculture and research projects. 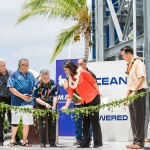 OTEC International has published the Draft Environmental Assessment (DEA) for the proposed one megawatt demonstration plant at NELHA’s Hawaii Ocean Science and Technology (HOST) Park at Keahole, Hawaii Island. The assessment which has been prepared at the request of NELHA, looks at the environmental implications at the facility’s proposed site. The comment period is open till August 22, 2012. 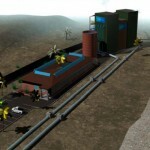 OTEC International LLC has been selected to build a 1 MW OTEC at NELHA, Hawaii. The RFI for this went out recently, with a very short deadline, so we were wondering if the choice wasn’t a given from the start. The main investor in OTEC International has also invested in Seasolar Power earlier. 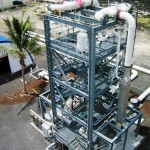 The Natural Energy Laboratory of Hawaii Authority (NELHA) has published an RFI seeking submissions from firms and or government agencies interested in developing a 1 megawatt Ocean Thermal Energy (OTEC) project at its 870 acre Hawaii Ocean Science and Technology (HOST Park) in Kailua-Kona on the Island of Hawaii.